The conscious dancer can either show up or show off on the dance floor. Showing off on the dance floor is often filled with past story, and future fantasy. These stories may include questions like, how will I be viewed by others or how will I view my self? What does he mean by that gesture? How can I move her? It is too easy to get caught in a mental rut that tightens the body and freezes the heart. I’ve danced there before and continue to watch how easy it is to return to those steps that are bound by conditioning and patterns. Experience has also shown me that there are moments on the conscious dance floor where it is possible to yield to reality in all its continuance, and to allow expression to be enough. When all thoughts of comparing, contrasting, or analyzing vanish and in their place moves a fierce alignment of confidence with what is. I learn to show up to the presence of the continuous movement moment. This is a field of friendliness toward self that is inherent in unbounded movement expression. It does not have a stake in the filters of approval or aversion. It just is! Participating on the conscious dance floor without expectation or longing provides us with an opportunity to be connected. This connection is not to any particular person, but to the energy and information that moves throughout the dance. It doesn’t belong to anyone and it can’t be claimed or owned by anyone. This connection happens as I allow body and sound and expression to be as they are. There is no need to explain or list reasons for being; I am motion. I am space. I am the shape of sound, in dialogue with reality, and that is quite sufficient in order to show up to the dance. So much of what happens on the dance floor is people stumbling through how to be, in relation to one another. So much emphasis can be put on pleasing one another, or understanding what the other is saying, or not saying. We can wind up occupying an inordinate amount of time in head thinking. It becomes impossible to lower, listen, and learn. As I am able to remember, I lower my thinking from head to gut. I listen throughout the surface of my body, especially to the silence spaces. I learn again and again about the spacious self-moving as shape. I experience a freedom and confidence in self, other, and all. The conscious dancer pays little heed to doing, organizing, or figuring anything out. This dancer is intrigued with the rising and falling of each moment. This dancer nourishes on the appearing and vanishing of gesture and grace, and cultivates deep gratitude for being in motion. This dancer situates in that space of grace where creativity summons itself to bear the fruit of expression as it yields to the fading moment. The conscious dancer realizes that dance is never for the faint hearted or timid. You don’t show up to the dance floor seeking answers, fulfilling personal agendas, or making statements, you show up with the inquisitiveness of an intrepid traveler, uncertain as to what is around the bend and excited to step beyond and discover what is there. This dancer possesses the confidence to hold the gaze of impermanence and invites it to accompany a duet in the swirl of unconditioned meaning. The conscious dancer enters the floor from the viewpoint that every belief held about dance must go. Fixed ideas about how it should look, what it will mean, fears of losing it, the ideal conditions necessary for it to develop, who should and should not be a partner, or how it will make for a better person are impediments to the realization of cascading gestures that are always arriving and departing. It is that recognition of impermanence that the dance offers as its depth of learning. To be relaxed in the vanishing moments is the great dance I remain devoted to learning. The conscious dancer does not have to be taught how to dance; instead, the removal of blocks to the inherent dance becomes the learning. Some of the more common blocks can include body stress, mental anxiety, and heart numbing fear of the unknown. The experience of this dancer who has had each of those impediments in varying degrees even after a life-long experience in the dance is that the relaxation of these blocks are supported as I place myself squarely in the dance. I learn the value of participation without story judgments. I enter a field of conscious dance and I suspend beliefs around creativity, grace, and dance that have accompanied me throughout. I learn the value to just participate in the manner and degree I can in each movement moment. I am enough; I am a necessary unique voice in the body choir of the moment. I recognize the fluid nature of each moment to invent itself, express itself, and then to vanish like the last breath. I open the doors of experimentation and play, I hear what I hear as sound and I give it shape and I enter into dialog. I notice any tendencies to contrive responses and give myself full permission to dance ugly and drool as I follow the lead of a dance that has been dancing me throughout the ages. 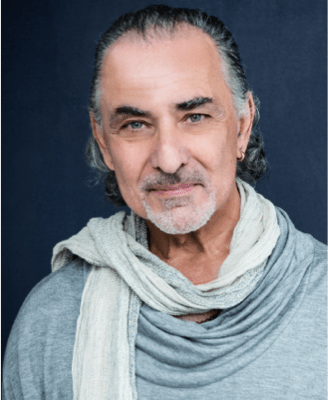 Vinn Arjuna Martí is an award-winning choreographer, global performer, master teacher and creator of SoulMotion™ a conscious dance practice and has been teaching movement for over 35 years. He found his life’s calling at a young age and in the process of following his path, has evolved a transformative movement practice that has touched the lives of thousands.